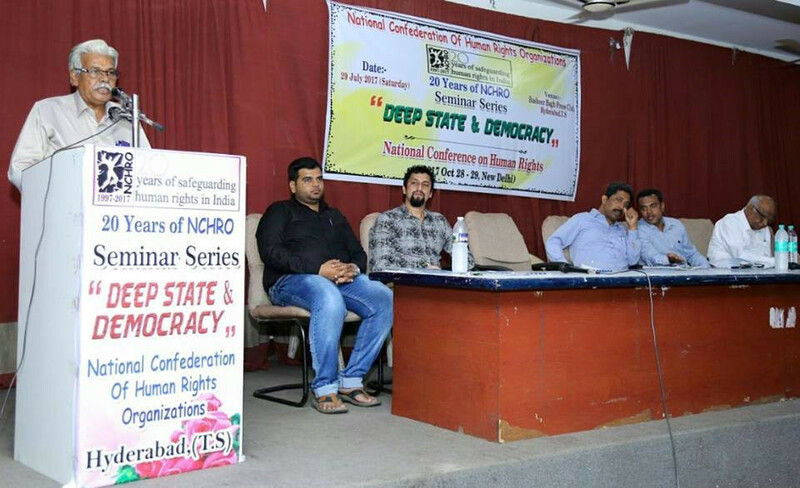 Hyderabad, 29 July: The National Confederation of Human Rights Organizations (NCHRO), Telangana chapter held a Seminar at Hyderabad, with the theme of “Deep State and Democracy”. This seminar was part of the NCHRO 20th Anniversary seminar series. The program started at 6.30 PM as scheduled. 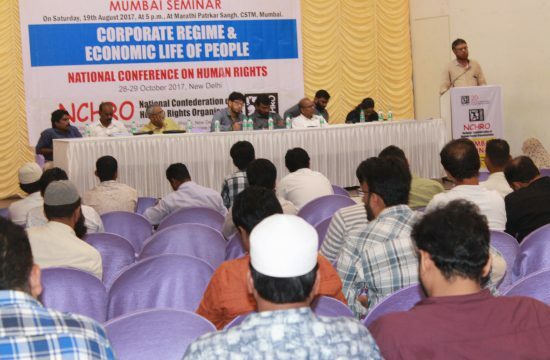 Mohamed Abid (Convener of NCHRO, Hyderabad) proposed the welcome remarks and warmly greeted all. Prof A Marx -Chairperson of NCHRO presided the programme and delivered the keynote address. The other dignitaries who spoke in the Seminar were Adv. V Raghunath (Vice President, APCLC), Mohammed Arif Ahmed (Zonal Secretary, Popular Front of India), Adv. 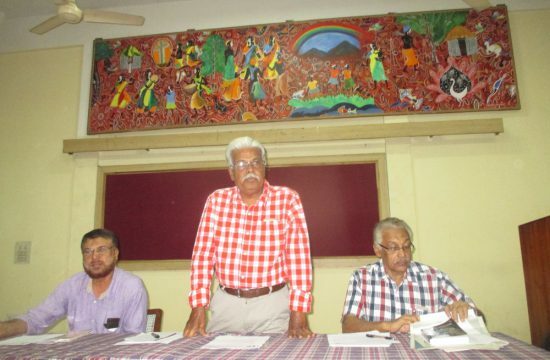 M.A Shakeel (NCHRO National Exco Member), Adv.Mahmood Ali (Senior Lawyer, Hyderabad), Shiraz Khan(Human Rights Activist, Hyderabad) and Mohammed Janib (NCHRO National Coordinator). We believe such seminars are essential for the advancement of human rights, democracy and the rule of law. 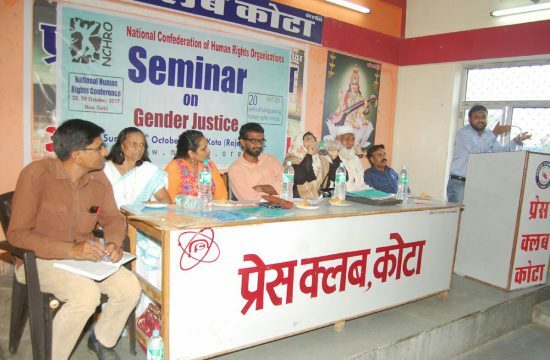 The seminar addressed current and future challenges for human rights work in our country. Fundamental Rights defined in our constitution ensure the goal of a welfare society. Whenever the State makes laws, they should be made consistently with constitutional principles with a view to establishment of an egalitarian society. Bills tabled in the legislature become law if approved by the majority of members. But that does not mean the law is just or fair. There are many laws approved by the majority that are unjust, unconstitutional or contrary to human rights.  Draconian laws such as MISA, PSA, POTA, TADA, AFSPA, UAPA etc. are ‘draconian’, oppressive, unconstitutional and against the principles of natural justice. These laws contain vague and wide definitions of crimes designed to include a large number of individuals. Supreme Court had upheld the constitutional validity of such draconian Acts. The courts have generally upheld the validity of emergency, extraordinary and security laws. On April 28th, 1976 during the Emergency the Supreme Court sank to its lowest when it decided the infamous Habeas Corpus case by ruling neither a detainee nor a court can ask for grounds of detention and no court is competent to go into questions of mala fide or alleged illegality under presidential order of emergency. Citizens’ fundamental rights could be suspended during the Emergency was the ruling given by apex court. Human rights organizations and sections of civil society have raised concerns over repressive laws because they violate rule of law. Such laws are used to terrorize our own people, employing a variety of techniques to impose conformity and isolate potential dissidents. They are prone to misuse and are misused by state agencies, targeting the most vulnerable groups and communities. The number of deaths caused by fake encounters is on the rise across the country that proved Supreme Court’s guidelines on encounter killings futile to enforce and continue to make it impossible to bring accused officers to trial. 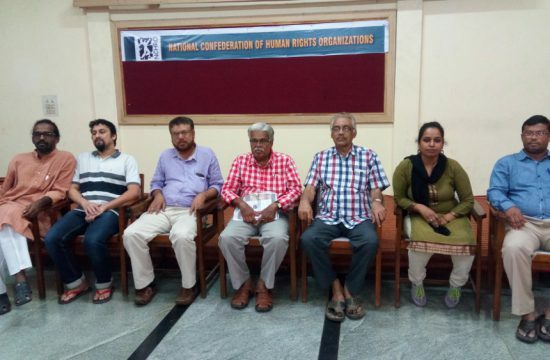 When NCHRO delegation met Telangana DGP on Aler encounter; we asked whether they followed apex court guidelines in this encounter and the reply was shocking that the DGP said that they already registered an FIR against the victims who was shot dead alleging that they attempted to murder police officers. Victims charged as Killers (attempt to murder) is the high drama continues as this Deep State has no respect to the rule of law and its methods became less democratic and more authoritarian, and thus destructive to the nation as a whole. Historically we can see in the Soviet Union, the KGB was a state within a state. They have custody of the country’s nuclear weapons, manage the strategic oil industry, monitor and scrutinize the activities of citizen, control political groups, search homes and businesses, infiltrate the federal government, create its own front enterprises, investigate cases, and run its own prison system. Attacks in Mumbai is yet another indication that what is commonly referred to as a “shadow government” or “deep state” where all the permanent institutions of government either captured or at least powerfully influenced and paying the price, with the innocent life and destruction. Who is the party spread violence throughout country? The death of Hemant Karkare still remains a puzzle. Who is the invisible hand pulled the strings that drew the curtain on his death? The newfound brotherhood of Zionism and Hindutva is alarming in which both push a narrower, muscular and intolerant version of ultra-nationalism and by itself is closely tied to the growth of the neo-liberal economic order. Both money and power regularly corrupt human beings but they coincide perfectly with the interests of the Deep State, particularly its corporate/billionaire arms. The systematic exploitation and social and economic abuse of our downtrodden communities in the name of development and forced eviction from their ancestral lands for corporates serve whose interests? Let’s come together. United by the same authentic morality, by something real and tangible together against a parallel state regime. The leadership of the freedom struggle strove for a secular country and the spirit of sacrifice was for a nation where all religious, linguistic and caste communities stood united against an imperial force, for national development. History tells us that the so called sanghparivar, stayed away from these struggle and sacrifice. While we enter to the seminar hall that is to the premise of Andhra Pradesh Union of Working Journalists (APUWJ); we can see police officers around in their uniform. They are here for not to protect civilians but to cause fear or intend to create a climate of fear, terrorize population, to intimidate the human rights activists from exercising their constitutional right to free speech. This is a live example of nexus of deep state. The problem is that many of the institutions of state are perceived to have been compromised to the suit of an authoritarian state. The police are just an instrument in the hands of deep state. The veteran thinkers like Narendra Dabholkar, M.M. Kalburgi and Govind Pansare were brutally assassinated but justice remains elusive and the government insensitive in solving these crimes and punishing the guilty. The hallmark of fascist and authoritarian forces has always been to suppress antagonistic thoughts by simply eliminating those who express them. The glorification of such elements today gives an accurate indication of the climate of deep state. The father of constitution B.R Ambedkar said that “I shall be the first person to burn our Constitution; If It is against the sentiments of smaller communities and smaller people who are afraid that the majority may do wrong”. We can see India is gradually being looked at as an intolerant nation, making headlines for all the wrong reasons and the word ‘ban’ is the keyword. There are far greater issues that India is facing that we need to address. Should law makers have any business to tell us what we should eat? The State entering the kitchen and the dining table of citizens can be allowed? Whether a person is moral or not depend on what they eat? Despite the past 69 years of deadly conflict, repression and resistance in Kashmir, Many thousands civilians have been killed, subject to enforced disappearance and thousands tortured. We shy away from investing any meaningful political effort to negotiate for a resolution. The use of pellet guns become symbols of curtailing democratic rights, they are perceived as tools of inhuman, degrading treatment and punishment causing further fractures in an already vulnerable socio-political context. Pellet guns have singularly contributed to the loss of physical and psychological health of a substantial number of people of the state. A significant proportion of time of highest judiciary is devoted to hear special petition leave and corporate cases. The Supreme Court is required to maintain a level of accountability to the public, independence from the other wings of the republic and credibility. On 2009, the Full Bench of the Andhra Pradesh High Court, in a judgment, made it mandatory for the police to register a first information report (FIR) against police officers after every encounter death. The judgment was a legal victory for the petitioner, the Andhra Pradesh Civil Liberties Committee, which had effectively campaigned against the fake encounters in the State, and would have had the effect of shifting onto the police the onus of proving that an encounter was not fake. But a three-judge Bench of the Supreme Court, headed by Justice K.G. Balakrishnan, the then Chief Justice of India stayed this judgment on an appeal by the Andhra Pradesh Police Officers’ Association. The stay has brought about an anomalous situation of silencing all those seeking immediate legal redress in cases of encounter deaths. These sent shock waves through civil society and reinforced people’s impression that on police misconduct; the judiciary generally stands with the establishment and not the people of India. Hundreds of encounter deaths take place in the country every year and over the years this number has multiplied into thousands. 6000 families affected by the killing in fake encounters over the four decades in Andhra Pradesh alone. Bhopal, Aler, Seshachalam and new killings adding to the list; Yet no policeman or personnel of para-military forces gets booked on charges of murder even after depriving others of their basic human right of life. This is because of the immunity they enjoy from being booked under the law. Out-of-turn promotions and bestowal of awards provide added incentives to become an outlaw to kill in the name of maintenance of law and order or in the name of self-defence. Prisons in India are overwhelmingly populated by undertrials. The right to speedy trial is not incorporated in any provision of the constitution, yet it is an inherent principle of any criminal justice system. Consequently innocent people are killed or arrested on charges booked with black laws, prosecuted and dumped in jails for years and years and ultimately they are proven ‘not guilty’ and released, by that time their whole life, and those of their family members are completely destroyed and that is what a deep state intend to do with black laws. The case of 90 per cent disabled and wheelchair-using Professor Saibaba shows that those in power could “do what they wanted, when they wanted and to whom they wanted,” and that to people who spoke up for the rights of the downtrodden. The Deep State is built on the structural advantage the executive has over the legislative and the judiciary; it has direct access to law enforcement and repressive intelligence agencies, the focus of the media, and regularly confers with economic giants. This Deep State trespassed almost invisibly on the boundaries of the Constitution for a long time, Unfortunately there seems to be no one group or leader who has the economic and political power to challenge this corrupted Deep State in a way that might avert this tragedy. Human rights work is becoming an increasingly challenging endeavor and human rights defenders require adequate preparation, specific technical skills and significant substantive knowledge in order to carry out their important work. In this context to strengthen the capacities of human rights defenders to effectively safeguard human rights and fundamental freedoms, I can assist whatever way possible. Standing out, being different was like drawing a target on your forehead. You had to have a special kind of courage to do it. To push forward Indian human rights, need Sacrifice but never doubt that a small group of thoughtful, committed citizens can change the world; indeed, it’s the only thing that ever has. Recently self-styled cow vigilantes in Rajasthan assaulted officials from the Tamil Nadu government who were part of a five-truck convoy transporting cows purchased by the state’s animal husbandry department from Jaisalmer. Even government own officials are not spared from mob rule. The phenomenon confirms, and perhaps even exceeds, the fears expressed by many critics of Prime Minister Narendra Modi and his Bharatiya Janata Party’s nationalist agenda, which they say is grounded not in bold economic reform, but in polarizing social conflict between Hindus and Muslims. If we live with restricted mentality, our economic, social and cultural growth will be reduced. The future of our nation is dependent on it being a secular and democratic society. The primary role of government is to protect rights of its citizens. These constitutional rights are not negotiable for any citizen. All legislation, regulation, and official actions must conform to the Constitution’s original meaning. We have to continue as a multicultural society that welcomes and promotes interaction and tolerance among people of different backgrounds. An officer’s daily duty is not to violate the rights of others. One needs to remember that we are unlikely to agree with every member of our society and everyone else is unlikely to agree with us on all matters. The increasing aggression of the Hindutva brigade and a political regime driven by its ideology which has been fed on hate is further polarizing our country. Certainly, the system is not perfect. But if everyone, be it the Government, MPs or judges, officials understand their role in the constitutional framework and carry out their responsibilities independently, the system can and will function effectively. If we retain our vigilance and political activism, we shall prevail. People all over the country strive for the realization of human rights according to their circumstances and in their own way. Congrats to NCHRO for being identified by your actions. In the aftermath of many beef lynching, police investigations are at a snail’s pace; victims’ families are sometimes threatened with counter-charges of cow slaughter; political condemnation has been absent or lukewarm all shows RSS would remain rooted in a form of social polarization that would help expand its Hindu base and command its loyalty at the expense of religious and inter-caste co-existence. Illegitimate authority is on the rise and democracy is gradually succumbing to the disease of neoliberal ideology so that more and more functions of legitimate government are being assumed by unelected, opaque agents and organizations. Millions have suffered crimes against humanity. We must call for all voices to be protected, before we lose our own voice. We must all find ways to come together to protect human civilization, and most of all the indispensable ways in which it enables human beings of all kinds to enjoy their guaranteed fundamental human rights. 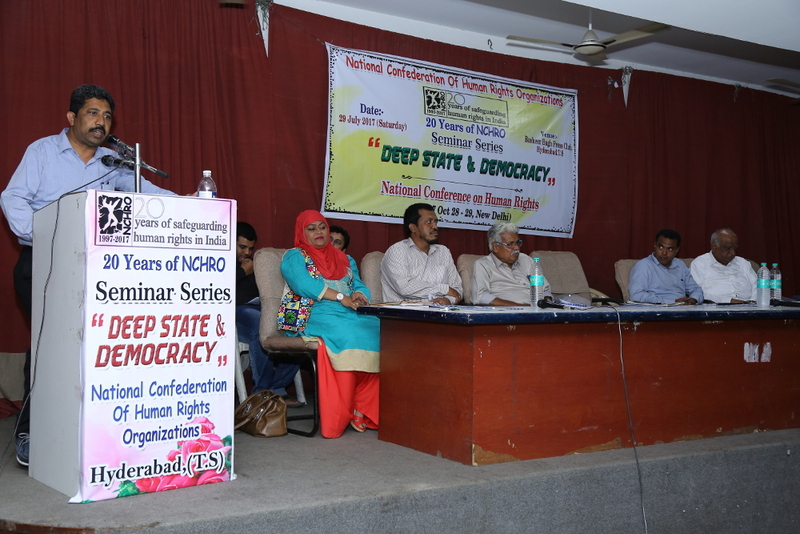 Adv.Shakeel (NCHRO, Exco Member) who spoke on the role of civil society in social change in his inspiring few words. Syed Moinudheen (NCHRO Telangana Chapter) presented Vote of Thanks. This Seminar was held on 29 July 2017 at The Andhra Pradesh Union of Working Journalists (APUWJ) Hall, Basheer Bagh, Hyderabad. 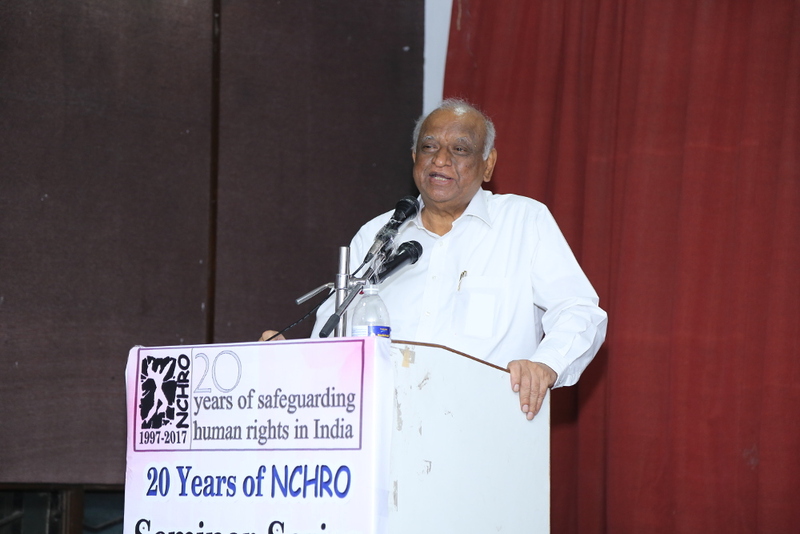 NCHRO has put together a seminar series in various cities across the country as part of its 20th anniversary, exploring various aspects of the human rights. Former Supreme Court Justice, N Santosh Hegde inaugurated the Opening Seminar themed “Terror Laws & their Implications” at a ceremony on 21 May 2017 at SCMI House, Bengaluru. The culmination “National Conference on Human Rights” being held on October 28-29, 2017 at New Delhi. This anniversary conference will gather human rights defenders, activists, former political prisoners, courageous dissidents and victims of rights violations from all parts of the nation and they will join hands to plan action strategies for a positive social change.